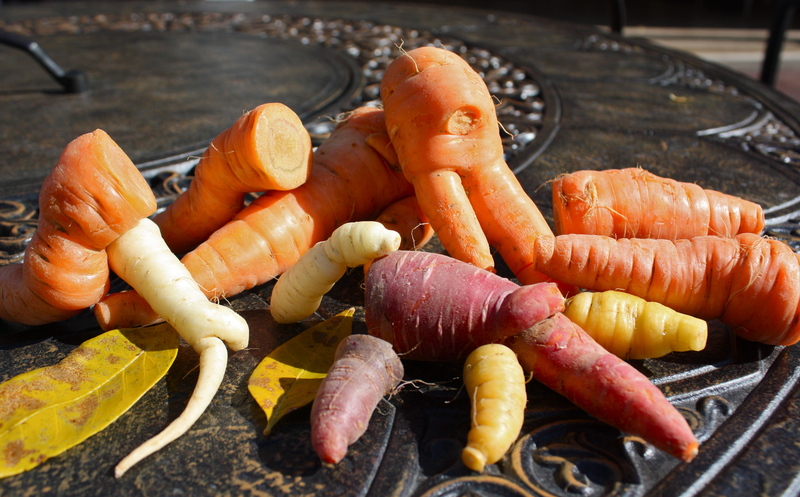 Peppery Sweet Roasted Carrots | "Il faut goûter"
My friend Corey grew some funky awesome carrots and decided to share! He showed up at my house with a bowl full of colorful carrots, planted and picked by his own green thumbs. Excitement ensued, as I believed these would be the first homegrown carrots I’d ever cook or eat! One looks like Snuffleupagus. Another, a resting finger. 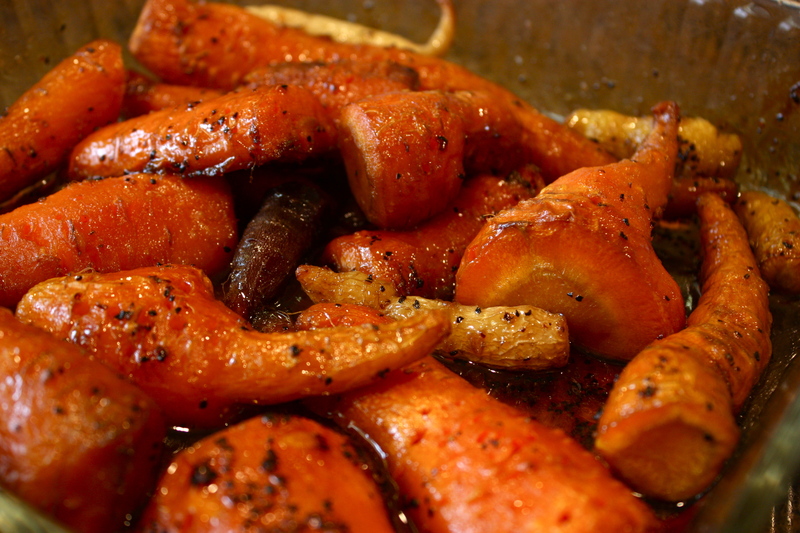 I could think of nothing better than to simply roast those carrots to a sweet outward crisp and inner softness. But I used a technique inspired by my mother–black pepper and brown sugar–because carrots are both sweet and savory, and the combination is surprisingly perfect! Leave the smaller ones out until about midway through baking--even doneness for all! Pour a couple tablespoons vegetable oil into a baking dish. Cut carrots into similar sizes, place them in the oil and coat them. Pour water over the carrots, then sprinkle them generously with coarse ground black pepper. Cut a couple tablespoons butter or margarine into chunks and scatter over carrots. Sprinkle a couple tablespoons brown sugar over carrots, then add a dash of salt to taste. Roast carrots at 350 degrees for 1 1/2 to 2 hours, until fork tender. Thanks again, Corey!! I look forward to seeing what else your garden grows! 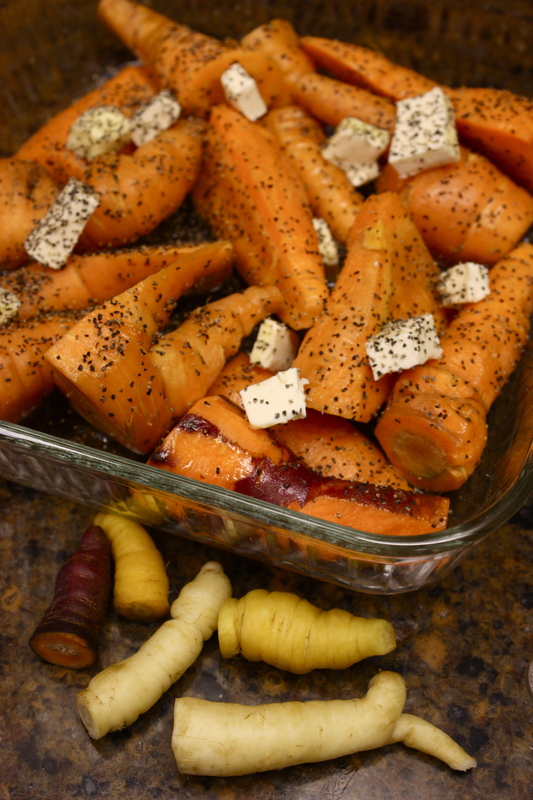 This entry was posted in Savory and tagged black pepper and brown sugar, food, homegrown, recipe, roasted carrots, vegetable sharing by needtotaste. Bookmark the permalink. Yum! I love funky carrots, especially smothered in butter! My mom used to make these carrots that had brown sugar, butter and ginger. The ginger is great for the winter because it warms you from the inside out! Ah, that sounds nice too! Ha, I like the carrot with two legs and a tummy or is it ah, anyway… this is a great recipe for carrots of all shapes and sizes! Beautiful carrots, *gorgeous* recipe! Simple and perfect. I’ll definitely use this lovely spa treatment for carrots!